Wednesday, February 22nd 2012 Cisco became a US Citizen!! 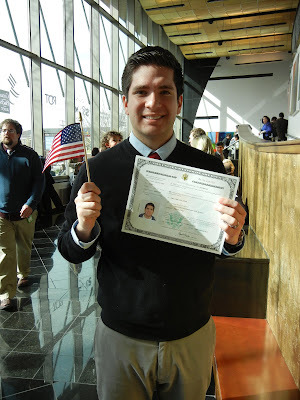 There were lots of reasons he decided to become a citizen and it ended up being such a great day. We weren't expecting a lot with his ceremony and it ended up being super patriotic and we all were crying. My parents came with us (his parents were sick) and me, my mom, and my dad were all teary eyed through the whole thing. The funniest part was the two weeks before his ceremony happened he got the dreaded letter in the mail... jury duty. Ha so funny. The trial ended up getting cancelled so he was off the hook, for a whole 2 months when he got another letter in the mail summoning him yet again. This trial also got cancelled. Hopefully he doesn't keep getting called until he has to sit through a trial. Alex Boye (he is in the Mormon Tabernacle Choir) was in the same ceremony and the judge asked him if he wanted to sing the National Anthem. very cool. Getting his official US Citizen certificate. We celebrated by going to Moochies of course. Because a philly cheesesteak is a perfect American meal. Here is a really fun video of Alex Boye singing the national anthem. I was so cool to see how emotional it was for him and brought tears to the eyes of almost everyone in the room. He said he has sung the national anthem over 100 times but was excited to sing it for the first time as a US Citizen.